Working with Navarro & Wright Consulting Engineers, Inc., the Committee is now moving forward with pre-design and engineering for four priority trail segments: Manatawny Trail, Coventry Trail, Upper West Trail, and the Pottsgrove Trail. This phase will result in preliminary site design/engineering drawings for these key trail segments. A presentation summarizing the preliminary design/engineering of the four key trail segments can be viewed here. Working with the Delaware Valley Regional Planning Committee (DVRPC), the Committee completed a trails feasibility study for the Region. 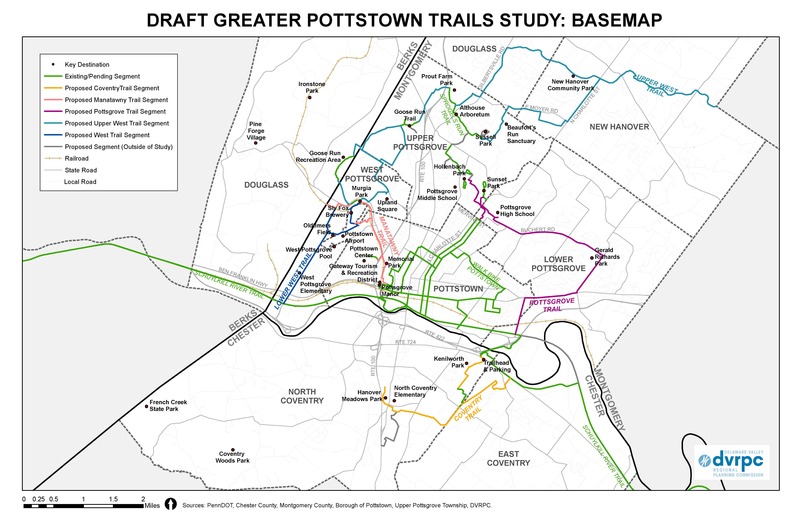 The trails feasibility study focuses on four major spine trail routes in the Pottstown Region that will include both on-road and off-road (i.e., trails) bicycle facilities. The first public meeting for this project was held on April 5, 2016. To download the presentation from this meeting, please click here. A second public meeting was held August 2, 2017.